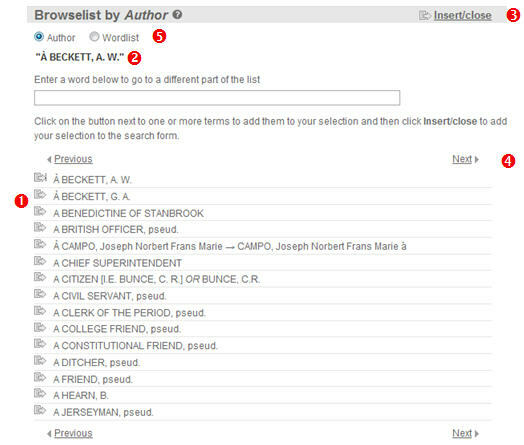 Each browse list contains the index terms for the corresponding search field, with the exception of the list accompanying All index terms, which incorporates all the terms occuring in the Subject tree, in the Place name tree and in the Person as subject field into a single alphabetical sequence. When you select a term from the All index terms list, your search is carried out on all three fields, whatever the source of the term. In the browse list, you may enter one or more letters in the search-box at the top of the window to find entries starting with these letters. You can also use the Previous and Next buttons at the bottom of the screen to move back and forth through the list. Each browse list contains cross-references, about which you can learn more here. Click on the append button/ ( in the screenshot below) to select a term or cross-reference. The selected item is then indicated at the top of the window ( ). You can select additional terms if you wish, using the same technique, and they will be added to the list at the top of the window. By default, if you select more than one term, they are connected with a Boolean OR, which means that, when your search is run, the software will look for records that contain any of the listed terms in the appropriate field. You can change this to use other Boolean operators by editing the terms once they have been inserted in the search screen. To confirm your selection and copy the selected terms into the search screen click the Insert/Close button ( ). Those for Author and All index terms also allow you to see a list of the individual words used in the fields by selecting the Wordlist radio button at the top of the window ( ). On the Title browse list, radio buttons in the same location allow you to switch between viewing a list of all the titles, a list of article titles and a list of book titles. Hint: If you add to your selection a term that you later want to remove, or if you opened the list after typing something into the search field and subsequently want to remove it from your selection, simply add the terms that you want to use and then click the Insert/Close button ( ). The items that you wanted to remove from your selection can then be deleted by editing the contents of the field on the search screen.